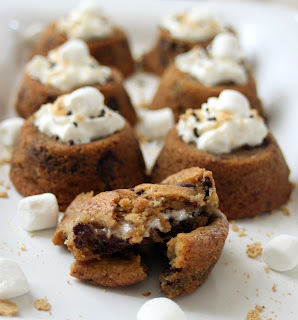 Our entire foodie friend community instantly went completely nuts with desire to make these. Somehow I was designated as the tester. I gladly accepted the honor! I'm not sure who originally took this picture (if you know, please e-mail me so I can sing their praises), but I have to admit, I was just a little skeptical. It didn't seem like the dough would close up around the graham crackers, and usually marshmallow disappears when it melts inside of a recipe. There was only one way to find out. I used just a regular tube of store bought cookie dough and sliced it into 1/2" rounds. That made everything SO easy. 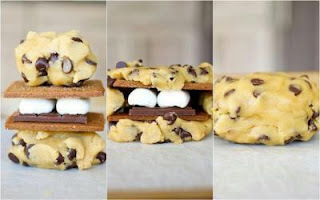 The rest is just like the photo shows, 1/2 graham cracker, 1/2 square of chocolate, 2 mini marshmallows, 1/2 graham cracker and another plop of cookie dough. I flattened out the dough (more like the second photo) before I started and it easily wrapped around the grahams to close up. 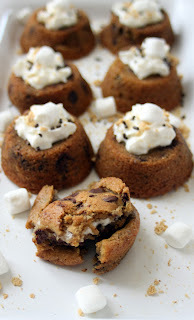 When they were finished, I sprayed a muffin tin and placed the cookies inside the muffin tins, just so they held their shape and nothing leaked out. I also doubled the marshmallows in a few of them to make sure I still got that gooey, warm marshmallow center that I wanted. It only makes about 10 cookies because remember, you're doubling the cookie dough. After eating two, you feel like you've just eaten four cookies. Because you have. And two s'mores. Thank you Dee, and whatever angel created these photos and this recipe. These are super easy, super fun and SUPER DECADENT !!!! Preheat the oven to 350 degrees and spray a muffin tin generously with cooking spray. Flatten out one of the cookie dough rounds. Keep it in flat in your palm. Place 1/2 graham cracker on top of the cookie dough. Place 1/2 chocolate square on top of the graham cracker. Place 2 mini marshmallows on top of the chocolate square. Place another 1/2 graham cracker on top of the marshmallows. Flatten out another one of the cookie dough rounds. Place it on top of the s'more and wrap the two cookie pieces around the sides of the s'more, closing it up tightly. Closing your palm up around the cookie dough will help to shape the cookie. Place the stuffed cookie into a muffin tin. Repeat steps until all the cookie dough is used. Bake at 350 degrees for about 15 minutes. Remove from the oven and allow to cool for about 10 minutes. Run a butter knife around the edges to free the cookies. To decorate and serve: Place the cookies face down on a serving dish. 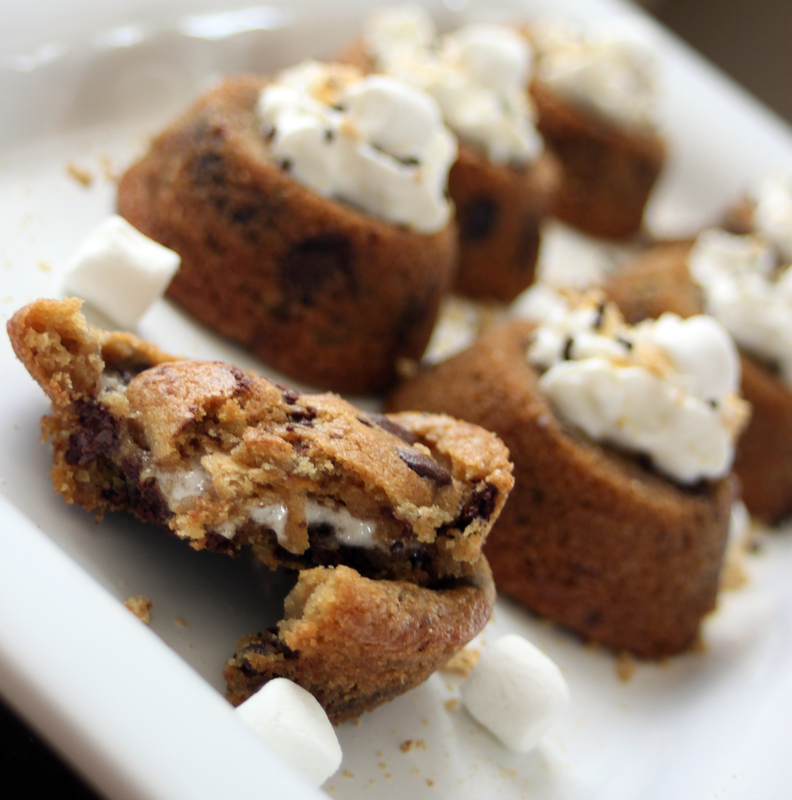 Garnish with whip cream, leftover graham cracker crumbs, chocolate chunks and marshmallows.